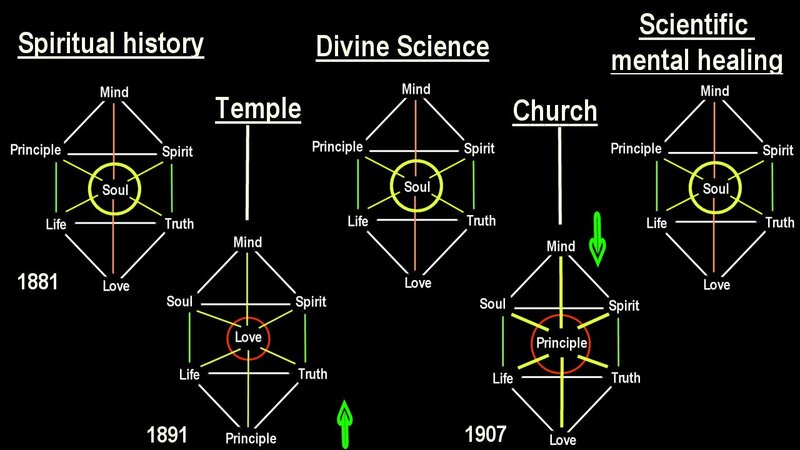 What Christ Jesus and the Apostle John had visualized, and had evidently worked with, Mary Baker Eddy had continued and built on into a majestic foundation for discovery, science, and healing. In the flow of this building, three different sequences of the synonyms for God became developed. The first sequence appeared in the Glossary. A new sequence was added in 1891 with the chapter, Science. Theology, Medicine, and another new sequence with the chapter Recapitulation. The latter was not finalized unto 1907. While the Platform covers all 16 elements of the "City of God" and the Translation structure likewise, Recapitulation covers only 12 elements with 24 definitions. With Recapitulation becoming the foundation for the Bible Lesson topics, its sequence for Good took the longest to develop. 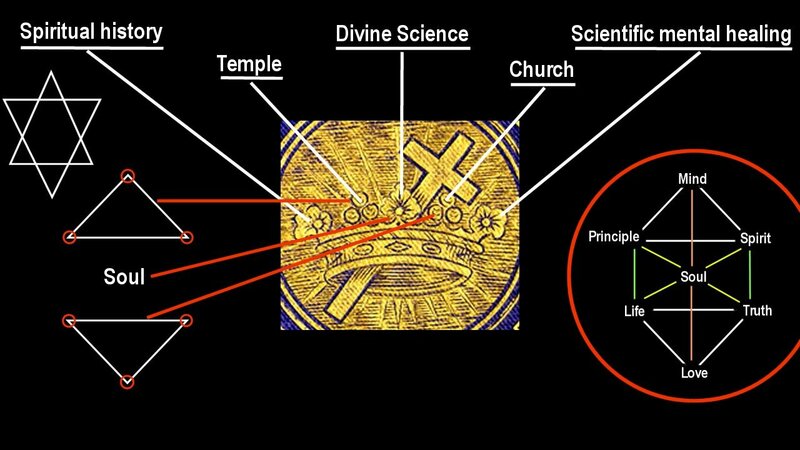 Since the synonyms for God are not hieratical in nature, I have taken it upon myself to present them in 'lateral' functional configuration, in a multiple triangular configuration. The triangle is unique in geometry, in that has no opposites, either sides or points. I have endevored to present the three different sequences according to the core function expressed in each context. 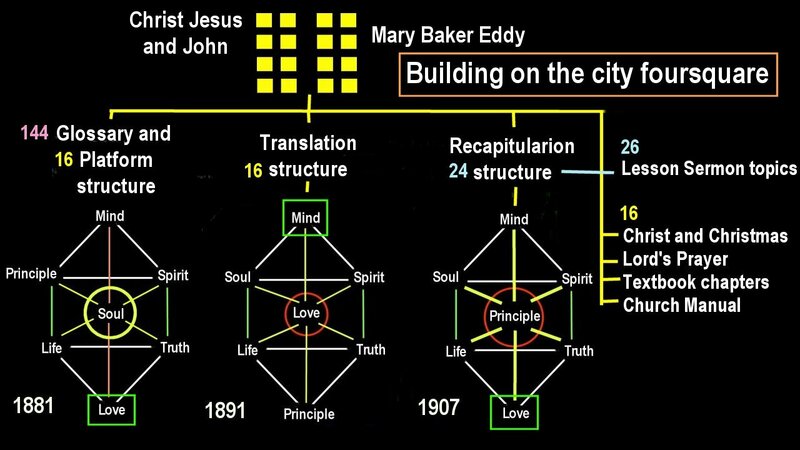 No evidence exists that Many Baker Eddy was thinking in terms of such configurations, but she apparently recognized the unique geometric nature of the triangle, because she selected and provided the building blocks for the church complex, which mandates a triangular layout, as is shown below. 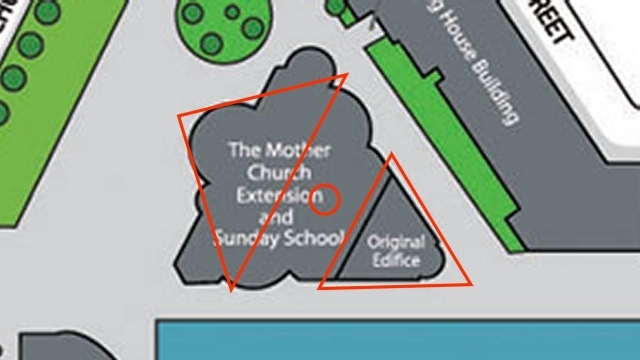 It is interesting to note that the double triangle structure matches the physical construction of the first Christian Science Church edifice in Boston, which was constructed 1894 on a triangular plot provided for the purpose by Mary Baker Eddy herself. A decade later, this original edifice had a second edifice attached to it, an extension edifice that Mary Baker Eddy had called a Temple. She had likewise provided the land for this second structure. The two structures were build back to back. In this manner they reflect in principle the double triangular model of, Temple and Church. We find this double triangular structure reflected in the crown of her seal long before the actual buildings were constructed.